Officer Hartnett proposes to his girlfriend after throwing out the first pitch. A Philadelphia police officer who survived an ambush in his patrol car in January had a special role in the Phillies home opener. 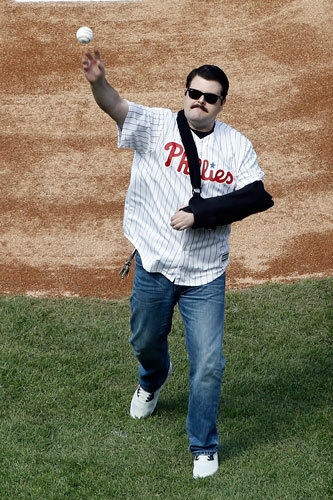 Jesse Hartnett was shot in his left arm, which was still in a sling, as he threw out one of the ceremonial first pitches Monday afternoon. Philadelphia Police Officer Jesse Hartnett throws out a ceremonial pitch ahead of the Philadelphia Phillies home opening day baseball game against the San Diego Padres. She said yes, and sealed the deal with a kiss. Hartnett said he had been planning this for about a month. Congratulations to hero Officer Jesse Hartnett on throwing out the first pitch @Phillies and for proposing to your girlfriend...well played. "It was kind of thrilling. It's a once in a lifetime experience to go out there and I wanted to utilize that time as best that I could; it was wonderful," Hartnett told Action News. Villanova national champs Ryan Arcidiacono and Daniel Ochefu also threw out a first pitch.